When I was in high school, I had a really good (male) friend, and one evening we decided to go see a movie. We ended up seeing The Killing Fields, which was a movie neither of us knew anything about, at all, but it was what was playing next when we got there. Turned out, as you probably know, that it related to the Vietnam War, and Cambodia in particular. That evening, I learned some things about my friend that I didn't know. Like that his dad was really his stepdad. His real dad died in Cambodia. It was a fairly emotional night for both of us. I was vaguely aware of the Vietnam War as a child, but only vaguely. It had never occurred to me before then that real people, you know, like friends' dads, had died there. 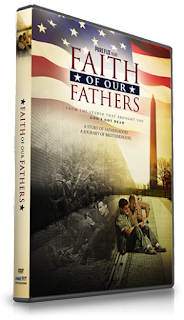 The synopsis of Faith of Our Fathers reminded me so much of that friend of mine. John Paul and Wayne are a little younger than my friend, but the whole idea of seeking to know the father you never got to know in real life struck me. I know every war results in casualties -- and many of those men would have left behind children who never knew them. It seems that the Vietnam War resulted in so many more of those situations. Maybe the anti-war protests and the horrible treatment of returning soldiers made some of this even worse for these kids. It is something to think about. And I think movies like this are important. We get a chance to identify with both sides -- the fathers and the sons who were left behind. I have to say that there was definitely a fair amount of scenes that felt pretty contrived, and there was some awkward dialogue. Even still, I was cheering for a positive ending (knowing I wouldn't truly get a happy one). I have a copy to give away! US and Canada only, please. Ooh, I hope we win! I've been wanting this for our homeschool for a long time!